Dixie Friend Gay is a nationally acclaimed artist whose prolific career spans more than three decades. The remarkable breadth of her artistic production encompasses public art, sculpture, painting and drawing. 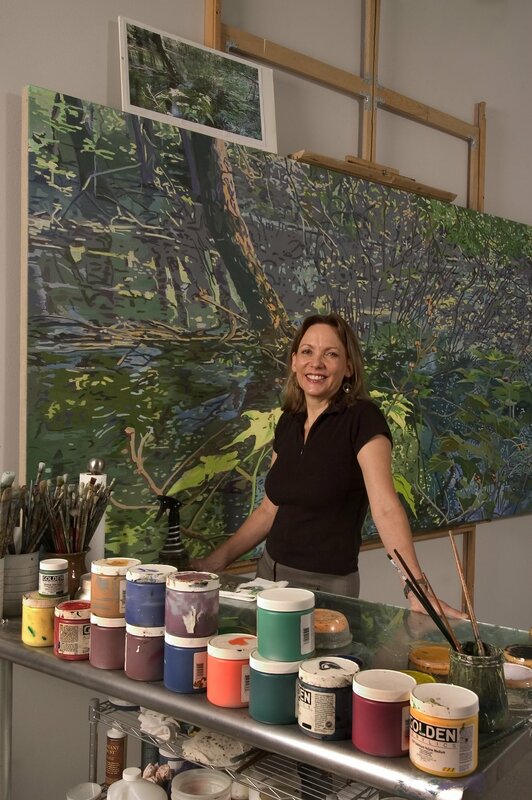 She is perhaps best known for her numerous public art commissions, including those at George Bush Intercontinental Airport, the Port of Miami, Indianapolis International Airport, Sam Houston State University and Texas A&M Galveston. Whether large scale architectural projects or intimate paintings, Friend Gay’s work is fueled by awareness of the natural world and its ability to induce altered states. Her public art has been recognized by Americans for the Arts “Public Art Year in Review” and has received multiple Craftsmanship Awards. Friend Gay was recognized as Texas Artist of the Year in 2003 by the Texas Commission for the Arts. Her studio art can be found in the collections of the Federal Reserve Bank in Houston Texas, Rice University, the Huntington Museum of Art in West Virginia and the Museum of Fine Arts, Houston among many others. The solitude and total immersion deepen the satisfaction of stroking colors onto canvas. Painting is the ecstasy of building a relationship through private conversations and then, as the final varnish is applied, a disentanglement from that intimate other. What always follows is the anticipation of the next new liaison that will be better than any before, perfect, pure and so alluring. Perhaps this coming together and letting go is universal to the creative process. Central to the newest series of paintings is the divining of an altered state of consciousness, a celebration of disorientation. The elation of nature distorted through the psyche, twisted by technology, is echoed in the final flicks of paint. In public art, my approach is to fuse the constraints of the space and the needs of the client so seamlessly with my own vision that the resulting project feels as though nothing could have existed alone.